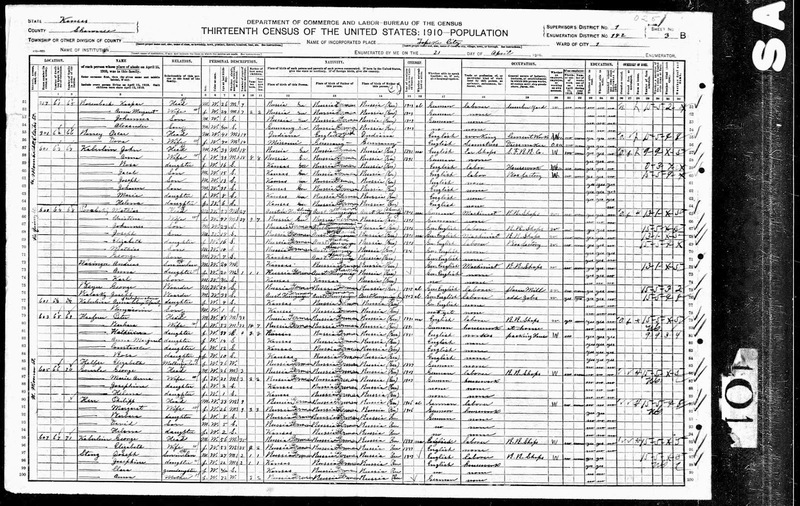 The 1910 Federal Census was the first for Mathias Porubsky and his family. Though they had been in the United States for 10 years, they missed the 1900 Census by just a few months, having arrived in Baltimore in June. Census enumerations are typically conducted in April. Reading the information below, there is so much interesting information to be gleaned. First of all, after just 9 years in the United States, the family owned a home free of a mortgage. Of course, many people in the household were working to support the family and probably help pay for that house. Mathias and sons Johannes and Joseph worked in the railroad shops, most likely for the Atchison, Topeka and Santa Fe Railroad. Even daughter Elizabeth, age 16, works as a laborer in a box factory. The Porubsky household was home to three generations. Their daughter Ann lived in the home with her husband Andrew Wasinger and their son Karl. Two boarders also lived there, who no doubt served as a source of additional income to the family. Interestingly, members of the Kaberline family lived on either side of the Porubsky’s. Mathias grandson Charles (late the owner of Porubsky’s Deli) would marry Lydia Kaberline in the 1940s. Porubsky, Mathias, head, male, white, 53 years old, married 27 years. Born in Austria-Hungry/Slov***. Father born in Austria-Hungry/Slov***. Mother born in Austria-Hungry/Slov***. Immigrated in 1901. *unsure if he’s listed as naturalized or alien – illegible*. Speaks German. Employed as a machinist in the R.R. shops. Is not out of work. Can read: Yes. Can write: Yes. Attended school in the last year: no. Owned a house free of a mortgage. ” Christina, wife, female, white, 47 years old, married 27 years. Number of children born: 9. Number of children living: 7. Born in Russia Ger. Father born in Russia German. Mother born in Russia (Ger). Immigrated in 1901. Speaks German. Not employed. Can read: No. Can write: No. Attended school in the last year: no. ” Johannes, son, male, white, 23 years old, single. Born in Russia German. Father born in Austria-Hungry/Slov***. Mother born in Russia (Ger). Immigrated in 1901. Speaks Ger. English. Employed as a laborer in the R.R. shops. Can read: Yes. Can write: Yes. Attended school in the last year: no. ” Joseph, son, male, white, 18 years old, 2nd marriage, single. Born in Russia German. Father born in Austria-Hungry/Slov***. Mother born in Russia (Ger). Immigrated in 1901. Speaks Ger. English. Employed as a machinist in the R.R. shops. Can read: Yes. Can write: Yes. Attended school in the last year: no. ” Elizabeth, daughter, female, white, 16 years old, single. Born in Russia German. Father born in Austria-Hungry/Slov***. Mother born in Russia (Ger). Immigrated in 1901. Speaks Ger. English. Employed as a laborer in a box factory. Can read: Yes. Can write: Yes. Attended school in the last year: no. ” Mathias, son, male, white, 10 years old, single. Born in Russia German. Father born in Austria-Hungry/Slov***. Mother born in Russia (Ger). Immigrated in 1901. Speaks Ger. English. Not employed. Can read: Yes. Can write: Yes. Attended school in the last year: yes. ” George, son, male, white, 7 years old, single. Born in Kansas. Father born in Austria-Hungry/Slov***. Mother born in Russia (Ger). Speaks Ger. English. Not employed. Can read: Yes. Can write: Yes. Attended school in the last year: no. Kaberline, Andrew, son-in-law, male, white, 24 years old, married. Born in Kansas. Father born in Russia (Ger). Mother born in Russia (Ger). Speaks German. Employed as a machinist in the R.R. shops. Is not out of work. Can read: Yes. Can write: Yes. Attended school in the last year: no. ” Anna, daughter, female, white, 20 years old, married 1 year. Number of children born: 1. Number of children living: 1. Born in Russia Ger. Father born in Russia German. Mother born in Russia (Ger). Immigrated in 1901. Speaks Ger English. Not employed. Can read: Yes. Can write: Yes. Attended school in the last year: no. ” Karl, son, male, white, 3/12 years old (3 mos), single. Born in Kansas. Father born in Kansas. Mother born in Russia (Ger). Doesn’t speak. Not employed. Can read: No. Can write: No. Attended school in the last year: no. Beyer, George, boarder, male, white, 24 years old, single. Born in Russia (Ger). Father born in Russia Ger. Mother born in Russia Ger. Immigrated in 1907. Alien. Speaks Ger English. Laborer in a flour mill. Is not out of work. Can read: Yes. Can write: Yes. Attended school in the last year: No. Balosky, Joseph, boarder, male, white, 33 years old, single. Born in Austria-Hungary/German. Father born in Austria-Hungary/German. Mother born in Austria-Hungary (Ger). Immigrated in 1903. Alien. Speaks German English. Laborer who works odd jobs. Currently out of work. Can read: Yes. Can write: Yes. Attended school in the last year: No. 1910 U.S. Federal Census, Shawnee County, Topeka City, population schedule, Enumeration District 142, Sheet 3B, Dwelling 68. Mathias Porubsky; digital image, Ancestry.com (http://www.ancestry.com : accessed 20 August 2014): FHL microfilm: 1374470. National Archives microfilm publication Roll T624_457.